Trial by Fire, the first Stargate SG-1 novel from Fandemonium Books, follows the team as they embark on a mission to Tyros, an ancient society teetering on the brink of war. A pious people, the Tyreans are devoted to the Canaanite deity, Meleq. When their spiritual leader is savagely murdered during a mission of peace, they beg SG-1 for help against their sworn enemies, the Phrygians. Initially reluctant to get involved, the team have no choice when Colonel Jack O'Neill is abducted. O'Neill soon discovers his only hope of escape is to join the ruthless Phrygians - if he can survive their barbaric initiation rite. 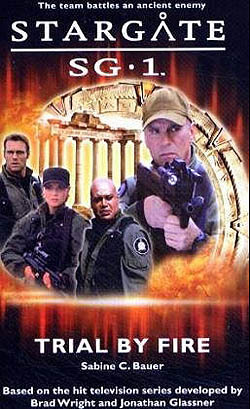 As Major Samantha Carter, Dr Daniel Jackson and Teal'c race to his rescue, they find themselves embroiled in a war of shifting allegiances, where truth has many shades and nothing is as it seems.